Patients with intracranial hemorrhage (ICH) are at increased risk for venous thromboembolism (VTE) and epileptic seizures. After spontaneous ICH, lower limb deep vein thrombosis (DVT) and subsequent pulmonary embolism increase the morbidity and mortality, and their prevention is of paramount importance. 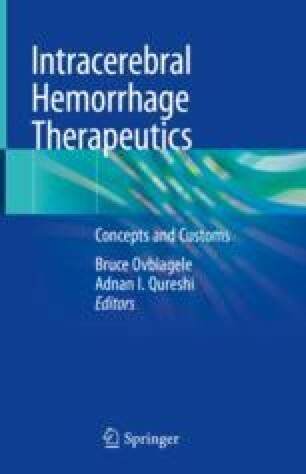 The use of pneumatic intermittent lower limb compression devices and early introduction of unfractionated or low-molecular-weight heparin after cessation of bleeding are well studied and represent efficient preventive treatment options. Patients with ICH should have intermittent pneumatic compression devices placed from the first day of hospital admission to prevent VTE. Graduated compression stockings are not beneficial to reduce DVT or improve outcome. After documentation of cessation of bleeding, low-dose anticoagulation with subcutaneous low-molecular-weight heparin or unfractionated heparin may be considered for prevention of VTE in patients with lack of mobility after 1–4 days from onset. Systemic anticoagulation or inferior vena cava (IVC) filter placement is indicated for those ICH patients complicated with DVT or pulmonary embolism. IVC filter placement should be preferred in patients with unstable hematoma at high risk of expansion and in patients with anticoagulation-related ICH. Patients with clinical seizures should be treated with antiepileptic drugs (AEDs). The latter also should be administered to patients with a decline in mental status who are found to have electrographic seizures on electroencephalogram. However, there are inconsistent data regarding seizure prevention in ICH. Although administration of prophylactic AEDs is a common practice, there is a lack of high-quality data from randomized clinical trials supporting their routine use. Early occurrence of seizures appears not to increase the risk of epilepsy, and prophylactic AED therapy does not prevent late seizures and epilepsy. Moreover, early epileptic seizures in patients with ICH do not worsen outcome, whereas prophylactic use of some antiepileptic drugs (phenytoin in particular) may be associated with adverse functional outcomes. In this section, we review the currently available data regarding the management of thromboprophylaxis and epileptic seizures following spontaneous ICH.